Testmasters knows the LSAT and the skills that you need to conquer it. We have inside knowledge about how the test writers think, we know how the students preparing for the LSAT think, and we know how to help them achieve a better score on the LSAT through our Testmasters LSAT course. Our experts have analyzed the latest LSAT exams. We have more than 15 years of effective test preparation experience to share with Testmasters LSAT students. We are also the only company that offers a preparation manual that includes every previously-administered LSAT Prep-Test (67 in total) since 2009. No other single publication includes every LSAT exam, and our manual is included with all of our LSAT courses. Testmasters knows what means success when taking the LSAT. Testmasters courses have helped thousands of students get into the program of their choice. The LSAT instructors are experienced in their fields and are extensively trained in the art of LSAT exam preparation. Unlike our competitors, our LSAT courses are taught by several instructors with specialized knowledge of specific areas who can help students pinpoint their challenges on the LSAT. We base our course materials on real exams, including unique strategies and tips to help you excel on test day. The manuals undergo a rigorous development process with multiple revisions to make sure Testmasters students receive a top-notch product. With hundreds of pages filled with sample questions and detailed explanations, the custom-designed manual forms the foundation for the Testmasters LSAT course from which our teachers draw out ideas to help students masters the skills necessary to ace the LSAT. Testmasters lets you learn how you want to learn. With our classroom, online, custom, and private 1-on-1 courses, you choose the learning style that works best for you. Each Testmasters course covers the same material, tailored to the particular format. Additional tutoring is available for any of the Testmasters LSAT courses. Testmasters knows cost is a concern. Our Testmasters LSAT course is offered at a lower cost than that of our competitors. Testmasters is confident enough to offer a 10-point score increase guarantee after taking our Testmasters LSAT preparation course. All LSAT courses come with all course materials including the manuals, 67 Actual LSAT Prep Tests, and 67 LSAT Solutions. This is the only preparation manual that offers every previously-administered LSAT Prep-Test since 2009. No other single publication includes every LSAT Exam and their solutions. If purchased individually each LSAT exam is $8, making this publication worth $400! Want to get a head start on your LSAT prep? Order the Testmasters LSAT course manual online. How do I register for a LSAT Prep course? 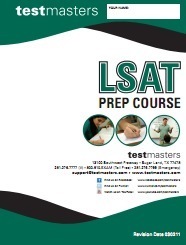 Students can register for Testmasters LSAT courses online or call (281) 276-7777. For private LSAT preparation courses, register online or call Testmasters at (281) 276-7777.